Music has always been an extremely important aspect of my life. I grew up training to be a classical singer (aka. opera) and competed throughout middle school and high school. My love of music is still with me but has taken a bit of a different shape – I love to see musicals, go to the symphony and I especially love to jam out in my car. I don’t know if this happens to you, but there are times (when I need it the most) that a set of lyrics hit me at my core. The ones from Demi Lovato’s song, Confident, recently struck a cord with me. Confidence – man, that was something I struggled with a lot when I was growing up – heck, I still do. Especially at work. There are a lot of times where I sit back and think, “How did I get to the point where people take what I say seriously? Don’t they see that I still have so much to learn?” But, being a consultant or advisor to our client, we need to be ready to explain our point of view at a moment’s notice with conviction. I can definitely say that I have become way more confident at work than when I started almost 5 years ago. I can attribute some of that to time and experience. You learn about the technical details, you learn how to properly conduct a meeting – these all come with time. But, there are still those situations where I don’t feel like I have my work life together and I start questioning myself and let the self-doubt creep in. Over the course of my career, I have figured out a few ways to help myself feel confident at work. I’m sharing my top 7 tips to feel confident at work with you today. 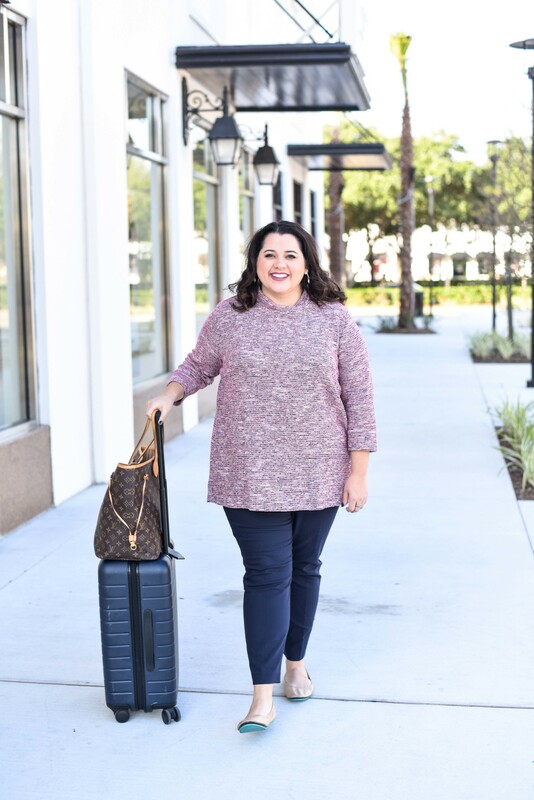 Wear items that you love and that reflect your personality – I’ve talked about this a lot before, especially about how I toned down the colors I wore when I first started out (you can find that post here). Wear items that are comfortable – I always noticed that when I was pulling at an item, whether it was too big and I was constantly pulling it up, or it wasn’t long enough and I was constantly pulling it down. 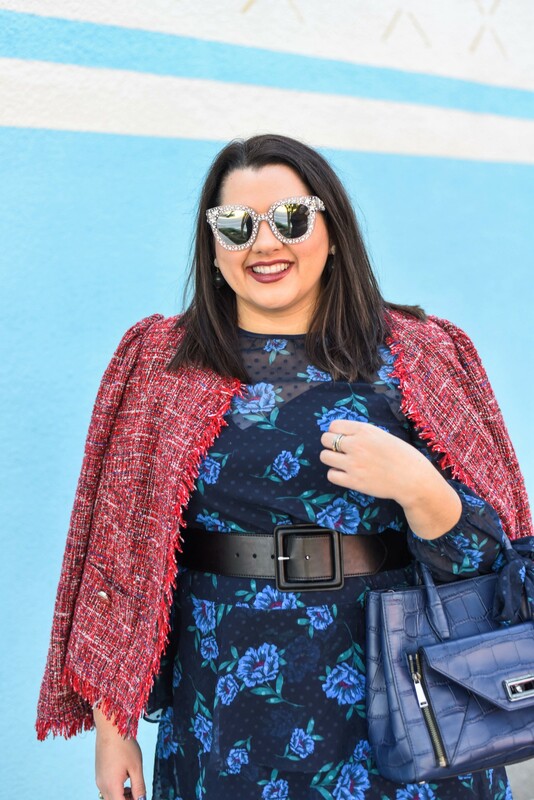 To find styles that work the best for me, I use a curvy Subscription Service (aka. Netflix for clothes), Gwynnie Bee, to try out different styles. I have found so many items, including this Eliza J dress, which I have loved to wear to work. If you absolutely love the item, you can purchase it at a discounted rate. Or you can send it back and keep trying other items until you find one you love. But the best part is that you have the ability to try different shapes, materials and colors of items and decide what works best for you and your company. Fake it until you make it – This old adage is true. Act with confidence and you may begin to feel confident. I am not advocating speaking about a topic you know nothing about, but, saying something like, “I do not know the exact answer to your question, but let me get back to you.” will show that you are in control of the situation, but that you are human, as well. Everyone will get it (or at least most people will, so they will understand. In my experience, as long as you follow up, everything will be peachy. Find allies – This is one of the tips that has had the biggest impact on me. Finding mentors and peers that will be your biggest cheerleader and also offer valuable constructive criticism to help you to be better is so important. My colleagues constantly challenge me to deliver to the best of my ability and acknowledge when I did something great. Maybe you don’t have this in your current position. If you don’t maybe start implementing it. Tell your colleague they killed a presentation. Build trust with them and, if you feel comfortable, ask if they could provide feedback on your most recent PowerPoint or ask them if they have any pointers for how you can lead your next meeting. If all else fails, find someone (a close friend, a family member, someone you trust) to be a mentor to you to provide guidance on how you can be the bomb.com. Learning your strengths and weaknesses can help to increase your confidence because you can find areas of your job where you will excel and find strategies to help overcome those weaknesses. Hustle, hustle, hustle – I cannot stress this tip enough. Learn the craft of your trade. Know your stuff. Work harder. Subscribe to industry newsletters. Study on the weekends to obtain a certification within your field. By becoming more well-versed in the topics you will be dealing with on a daily basis, your confidence will skyrocket. Play some pump up music before going into a big presentation or meeting – Do you have a theme song that makes you feel like a boss? Play it! I guarantee it will help to ease your nerves a bit and help you crush that meeting. Stand like Super Woman – Put your hand on your hips with your elbows facing outwards. I kid you not – research has shown that standing like a super hero can make you feel like a super hero and have a ton of confidence. What are your tips to feel confident at work? I would love to hear about them! P.S. There is a really fun story behind shooting these blog photos – it started raining almost immediately after we jumped out of the car. What are you going to do? I was all ready to go, I was having a good hair day and we found this awesome wall. So, we shot the photos any how. There are some photos where you can see the rain. But that’s how life works – it’s not always according to the plan that I laid out. There are photos where you can really see it, others you may not have seen it if I didn’t say something. But, I think it was God’s way of telling me that I am not in control, which is not always easy for me to accept. As Emily Ley’s book keeps reminding me, live a life of “grace, not perfection.” So we shot in the rain and by the end of the shoot, I was dancing and having a blast. Finding allies has been my best move so far! Love this! Such great tips and reminders on how to be that GirlBoss. Rain or shine you look beautiful. love all of your wonderful tips! and you look radiant in that beautiful blue dress! So many great tips. You look fabulous in this color!! Emily- I LOVE this post so, so much!!! This gave me a jolt reading it! Your positivity is infectious! That’s so amazing you trained to be an opera singer. I totally agree that music is so helpful! Love all your tips, girl. Such a great post!! I love the “stand like super women”! So much girl power in this post I love it!! Aww, thank you so much, Sarah! My confidence has definitely been a journey, but I am so grateful to now be in a place where I feel confident most of the time! Your confidence shines so bright! I loved all of these! This post definitely hits home! I already do some of these tips, but I’ve added a few more to my game plan when I need a little extra confidence! Awesome, I’m so glad that you found this helpful! Keep up the great work, girl! Such good tips — finding allies is KEY! Thank you, Ashley! Having some people to vent to and get advice from was one of the steps towards building my confidence. These are awesome tips. Working in a job where I interact with top executives I always have to make sure I come off as confident. Thanks so much, Bev! So true – I may be a bundle of nerves on the inside, but showing them that I am confident is so important. 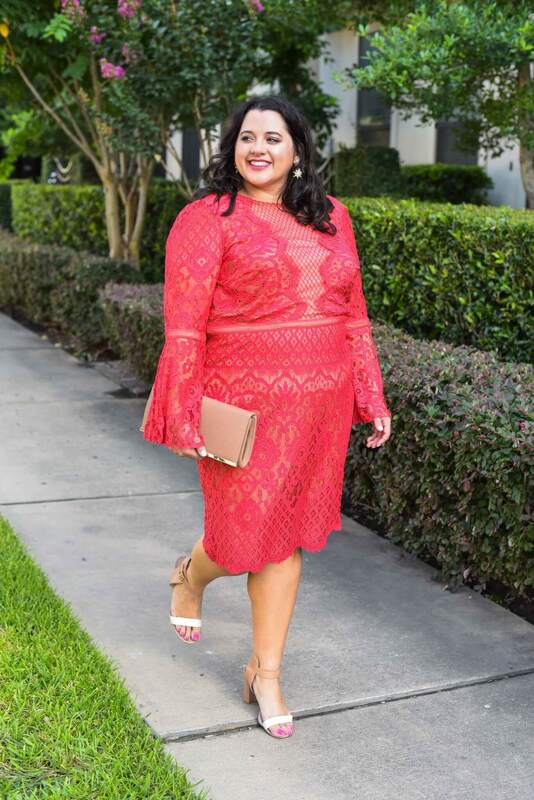 This dress is gorgeous on you! I love these tips too! I’ve read about the superhero stance before. I need to try it!! Thank you so much, Lauren! I was skeptical at first, but I actually think the Superwoman stance works for me…it could be placebo, but if it helps, I guess why not? I love your tips and that blue dress is AMAZING!!!! i love these tips and that dress is gorgeous on you! 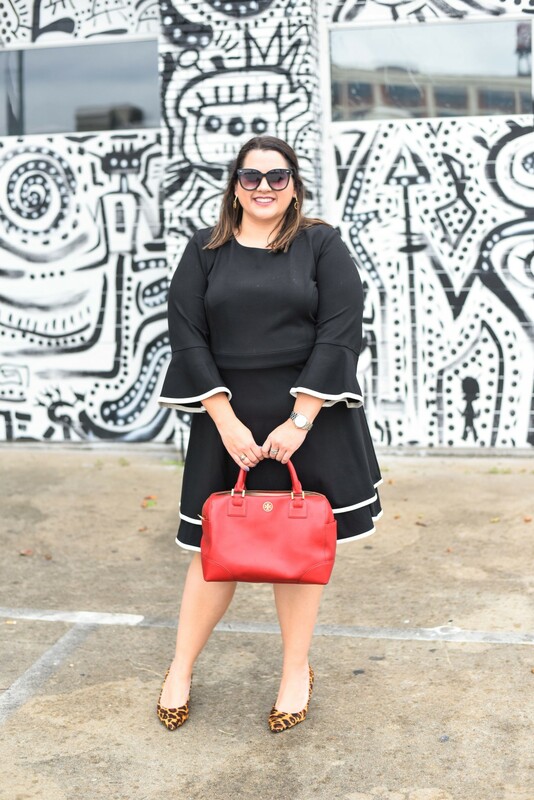 I totally believe in the mantra of “Dress well, test well” and I think it can be applied to any situation, whether it be professional or personal! 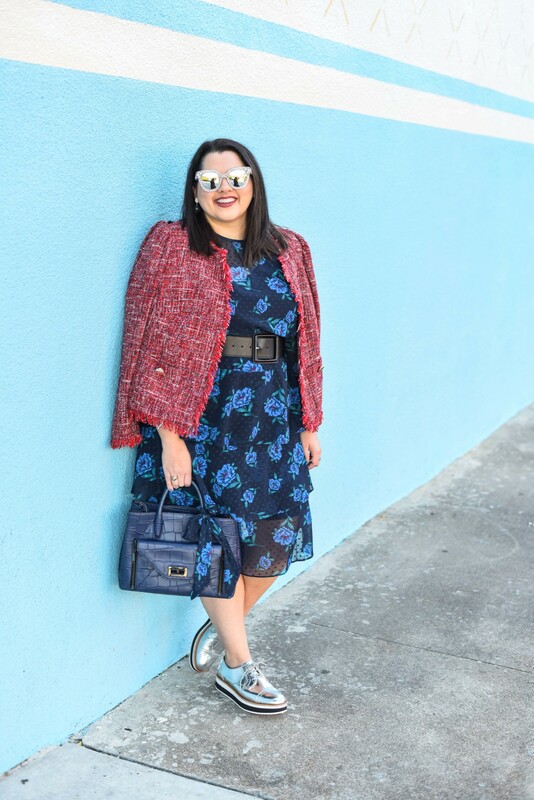 You look great in this blue dress and I loved your tips for finding your confidence! Thank you so much, Sara! I totally agree, dressing well in my personal life has also helped my confidence. Thanks for stopping by! Love this! So so true! I need to do the superwoman stance more often, Lord knows I could use some Catwoman vibes in my life! lol! Haha!! I love Catwoman and doing the Superwoman stance – it’s so strange…but, it works (at least for me)! Such a great post filled with great tips! I find when I dress well I feel more confident! Thank you so much, Emily! I am the exact same way. Looking the part is half of my confidence battle!